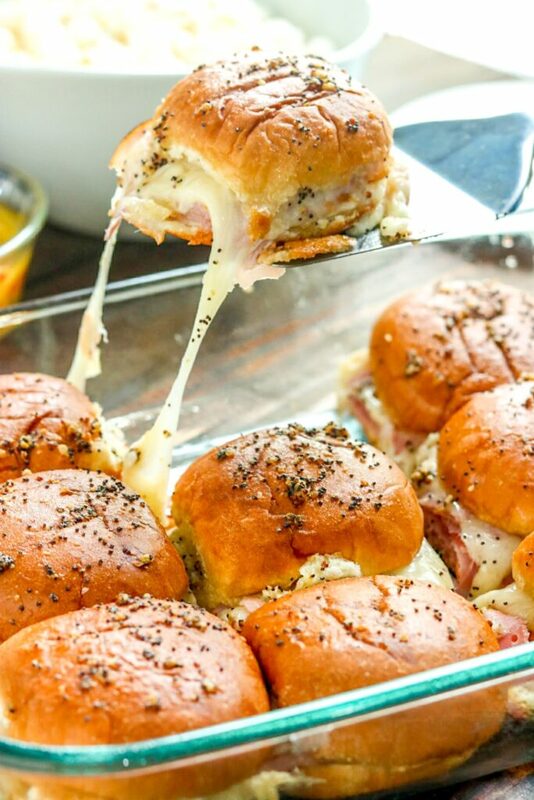 These EASY hot Ham and Pineapple Sliders are PERFECT for game day. Make a double batch to feed a crowd! Get ready, people!!!! I’m about to share my absolute favorite recipe for feeding a crowd. These Hot Ham and Pineapple sliders are ooey and gooey, and last about 3 seconds on a party table. Bring these little beauties out and you’ll be the most popular person there! I love how low effort these are with a BIG result. 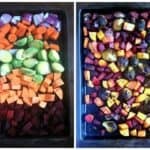 I regularly make 2-3 pans of these for bigger groups, and never ever have leftovers. Make ahead and bake at a party, or in your own kitchen, you’ll be glad you did! Serve with some condiments (if you MUST) like extra mustard, maybe some pickles – but trust me, you won’t need them!! Made with Pepperidge Farm Slider Buns (I used the plain ones here), but they also come in a wide variety of yummy flavors (White, Sesame, Potato, Sweet and Soft, Wheat) so you can change it up depending on what you like. They’re made without High Fructose Corn Syrup and no artificial flavors, and they’re soft and squishy and delicious. 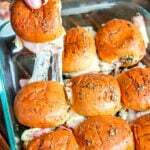 PERFECT for these Hot Ham and Pineapple Sliders!! You can use leftover ham from Christmas or Easter, or you can get shaved deli ham and call it good. It won’t matter, the soft bread with the buttery topping and baked up – it’s all delicious. Find Pepperidge Farm Slider Buns in the bread aisle of your local grocery store! Spray a 9 x 13 baking dish. Layer the bottom halves of the slider buns in the dish. Layer the ham, pineapple and cheese over the buns. Top with the top halves of the slider buns. Melt the butter, and whisk in the poppy seeds, mustard, garlic, salt & pepper. Brush topping over tops of sliders. If you have any leftover, pour it evenly over the buns. Bake at 375 degrees for 15 minutes until cheese is melt-y, and the tops are browned. These look tasty. I love ham and pineapple together! Kylee, I absolutely love these. What an awesome idea. If I make these, I’m pretty sure I’d be able to get the boyfriend to do whatever I want. Hello clean shower. I don’t know who came up with the idea of ham and pineapple, but I love that person. This is such a great idea for a slider! Love the sweet and salty taste combo here with the ham and pineapple. Such a decadent perfection, easy appetizer for a party too! Now I am craving this I will need to make it this weekend. We went to Hawaii for our honeymoon, so this reminds me of that. What a great way to feed a hungry crowd. Great for “game night” or after a day of playing outdoors in the cold. Looks amazing! I wonder what it would taste like with a different kind of meat since I don’t eat pork. I’m going to have to try it soon. This sounds so tropical. I love the combination of ham and pineapple. Those breads look so soft and melt in the mouth!! Can’t wait to try this. That’s one absolutely delicious looking sandwich. I love the combo of ham & pineapple! These sliders would not last long at all in my house. Pinning this to make for my next party! this will be perfect for super bowl party or any party. I like the idea of adding pineapple in sliders. Which gives sweet and sour flavor to snack. These would be hit on Game Day! 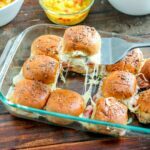 I love the combination of ham and pineapple..these sliders look out of this world! That’s an absolutely delicious looking sandwich — sweet and savory all at the same time. Love that click with the cheese stretching out beautifully. That ooey gooey cheese is almost too much for me. That is a total weakness of mine. I’ve yet to find a cheese I don’t love. Yes, even the strong ones – those I cook with. Your slider buns are just the thing for a gathering or a Super Bowl party. Just the perfect size to grab and run. Yum, yes!! This is perfect! I love sliders in all shapes and flavors. This is the perfect blend. This is perfect game day recipe, I haven’t tired pineapple in the bread,I think I need to. This is cheesy delight with ham who can resist this. When comes to make sliders I like pepper ridge farm bread. I made these sliders for the kid’s party last week and they loved those stretchy cheese and the savory flavor of the bread. What a great snack for the Super Bowl! 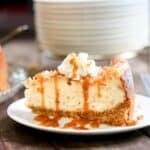 Ooey Gooey delicious and easy! My family could eat sliders breakfast lunch and dinner. I love your recipe and that you have included a few different options to make a great slider. I think dinner is solved for today.